Recently I addressed in some comments this subject of who a Christian is – and who is not. As you know, we have had the tiring mantra of “we are all sinners” thrown at us as an excuse for abusers and as a club to force us to “show love and forgiveness.” We aren’t buying that line anymore. The Christian is not a sinner. We still sin, but “sinner” is no longer the title Scripture gives us. Saint, heir, child of God, beloved, holy ones – these are the terms the Bible uses. They are led by the Spirit (Romans 8). If they aren’t, they are not Christians (also Romans 8). They are characterized by a heart desire to do the things Paul describes as the fruit of the Holy Spirit (see Gal 5) and they are grieved at the things of the flesh. They have all been “taught” by the Spirit of Jesus (1John 2:27 But the anointing that you received from him abides in you, and you have no need that anyone should teach you. But as his anointing teaches you about everything, and is true, and is no lie–just as it has taught you, abide in him). And one of the fundamental things the Spirit of Jesus has taught them is to love. Do abusers love? I don’t think so. Of course not. And then you have that whole body of Scripture in which Jesus teaches us about trees. Good trees bear good fruit. Bad trees bear bad fruit. You can tell what kind of tree they are by the fruit. Matthew 7:16-18 You will recognize them by their fruits. Are grapes gathered from thornbushes, or figs from thistles? (17) So, every healthy tree bears good fruit, but the diseased tree bears bad fruit. (18) A healthy tree cannot bear bad fruit, nor can a diseased tree bear good fruit. I could go on, but the point is that there are many things that are true of every Christian and we must take care not to be drawn into the false and common claim “but we are all sinners.” I say again, the Bible never calls Christians “sinners.” It gives many titles to us, but “sinner” is not one of them. A Christian will never continue to walk habitually in sin so as to be characterized by sin. If a person is so characterized, they are not a Christian. This does not mean the Christian in this life is ever perfectly sanctified, but it does mean that there are many biblical standards that we must hold people to who claim to be Christians. A person who is habitually abusive to others and is not truly repentant about doing so is simply not a Christian. When pastors or churches or counselors and others excuse the abuser’s wickedness with the get-out-of-jail-free card “we are all sinners,” they are denying God’s Word on the subject. Really, they are lowering the standard so low that essentially anyone can be a Christian. Obedience to Christ, they say, is not necessary. Their “free and gracious” salvation means that faith without works IS worthy of heaven (no matter what the Apostle James said). 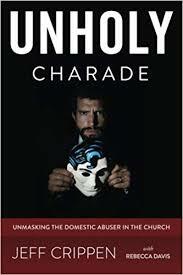 It is just such a “gospel” of universalism that is a plague in the churches today and largely explains why your abuser sits in a church pew, accepted by “the saints,” while you are outside the doors. Often times, the folks who excuse the abuser by saying, “Well, we’re all sinners,” and treating him as a believer because of his verbal profession of faith…to often these are the exact same people in the exact same churches who shun the abused spouse for “refusing” to reconcile with her abuser. So, why is the abuser’s sin swept under the rug as “We’re all sinners,” while the abused spouses (supposed) sin is considered just cause for shunning or even official church discipline of excommunication? Why isn’t her (supposed) sin at least treated equally as “we’re all sinners”? The fact that it’s not highlights the reality that this is not really about grace at all. If they were really going over-board on grace with little fruit-inspection discernment, they would at least offer the same measure of grace to the abused as to the abuser. No…the double standard…with the slant away from justice…exposes their true motives, I think. They are more interested in hierarchical authority than they are in grace. The abuser’s sin is grievous…but he knows how to play the game of giving lip-service to hierarchical authority. While the abused spouse is fleeing for her life and cannot afford to allow the hierarchical authority niceties to further entrap her. So…they discipline the one who violates their hierarchical authority. It has nothing to do with sin or grace or even salvation. It’s about authority…and power. But if we add ANYTHING to the list, doesn’t that make it a,”law?” Love Jesus as lord and savior AND ________. But I also know you can’t just do anything you want to. I struggle with this idea. I THINK the “doing” (fill in the blank) is sort of PROOF that you do actually love Jesus as your lord and savior. It’s not added, but an outpouring of. Yes? I appreciate your observations. I’ve found that the abuser often expects instant forgiveness, but is not at all willing to grant any kind of forgiveness to those who do not instantly offer forgiveness to the abuser. Very ironic and shows the hypocrisy of their demand for forgiveness, which is not a true value of theirs, but merely another manipulation tactic. Spot on! Well thought out! It is my understanding that universalism teaches all WILL be saved, does it not? I believe every person is OFFERED salvation, but cannot be saved unless he or she gratefully ACCEPTS that offer! A gift offered, unless it is received, is never opened or appreciated nor is it effective or useful in any way. That’s the true beauty of the gospel, (even for those who reject it) as no one can say they weren’t given the chance to receive the gift of salvation. And truly special things are were planned in advance for to those who do receive this marvelous gift! I agree that there are those who do not evidence any change in character and therefore could never have genuinely received the gift of salvation, no matter what they may say. They are without excuse. Unfortunately I have met far more people who call themselves a Christian, bear rotten fruit, and basically have a unregenerate heart. I have seen some behave like the devil himself. In light of this, I understand why the Lord had said that the road to life is very narrow and few find it. These pseudo or nominal Christians have deceived themselves believing that they belong to the Lord. I remember a long time ago a lady who I described here in another post would talk about “all of us” joining in the sins she would describe about herself. She generalized that all were just like her. When I would hear her speak this way I would hold my tongue and think to myself “maybe you engage in so and so, but don’t count me in. That is not who I am in Christ.” It was almost like her wicked covert way to try and be the accuser of the brethren. I tried to stay away from her whenever I could as I felt darkness around her. It will be a glorious day when we are all with the Lord forever and never have to be around wolves in sheep’s clothing ever again. Consider Romans 5:8. While we were yet sinners, Christ died for us. WERE sinners. Past tense. Birds of a feather…..I find those who manipulate seem to play along with other’s manipulation AND will gang-up on a proven target, especially once the target refuses to be abused. It is a “let’s get her/him back under the abuser’s control” code so when their target requires the same “counseling,” they have a back-up bully support system. They truly see nothing wrong in their behavior and can not understand when others question/doubt/challenge their actions. I would rather be alone than to be associated with the wicked. Definitely. Better to be alone.